With our relaxing outdoor patio and free Wi-Fi, there is no better place to enjoy a hot or cold beverage, so stop by Cha Cha Java Inc. and enjoy the atmosphere and one of our many delicious offerings. 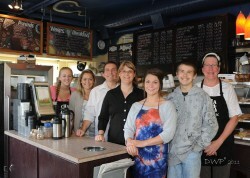 Food and Baked Goods At Cha Cha Java Inc., we are known for our fresh baked goods, which are made in house. They are award winning! We also have an excellent selection of sandwiches, wraps and paninis. And for those who like to extend their mornings, we serve breakfast all day.